On May 18, 2016, the US Department of Labor (DOL) announced the Final Rule amending the “white collar” overtime exemptions to increase the number of employees eligible for overtime, effective December 1, 2016. Got overtime? There is no phase-in; it is immediately effective on December 1st. We all know that the Affordable Care Act (ACA) placed heavier burdens on employers with the employer mandate for employee health insurance. But, the burdens didn’t stop with the ACA!! Oh, no! In 2014, President Obama signed an Executive Order directing the Department of Labor to update the regulations defining which white collar workers are protected by the Fair Labor Standards Act (FLSA) minimum wage and overtime standards. How else could we financially burden employers? We could mandate employers pay overtime to salaried workers!!! Oh, we already do? Let’s raise the overtime salary threshold exemptions so more employees receive overtime!! You ask, “How is the DOL Final Rule on white collar exemptions germane to my health care agency/practice?” Answer: Do you have employees? If yes, the Final Rule is applicable to you. If no, there is no need to read this blog (unless you are a salaried employee and want to receive more overtime). The new, increased salary threshold for executives, administration, and professionals exemptions swells from $455/week to $913/week or $23,660/year to $47,476/year. The number for the ceiling is actually less than what was proposed by $800/week. These numbers are based on 40th percentile of full-time employees (salaried) in the lowest wage region, which happens to be the South. Don’t get your knickers in a knot. Furthermore, the exemption for the highly compensated employee will jump from $100,000 to $134,004 (odd number). This number is $12,000 more than the proposed amount. Well, that just dills my pickle! 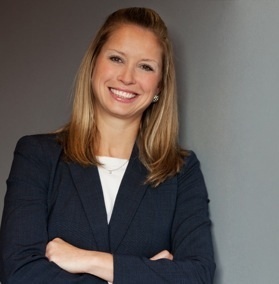 The Final Rule also requires that the salary threshold for executives, administration, and professionals be reviewed every three years in order to maintain the salary exemption comparable to the 40th percentile of full-time employees (salaried) in the lowest wage census region – the South. Finally, the salary basis test will be amended to allow employers to use non-discretionary bonuses and incentive payments, such as commissions, to satisfy the requirements up to 10% of the salary threshold. The allowance of non-discretionary bonuses and incentive payments was meant to soften the blow of the increased salary thresholds. That’s about as useless as a screen door on a submarine/a trapdoor on a canoe. The Secretary of DOL issued a time-limited non-enforcement policy for providers of Medicaid-funded services for individuals with intellectual or developmental disabilities in residential homes and facilities with 15 or fewer beds. From December 1, 2016 to March 17, 2019, the Department will not enforce the updated salary thresholds. BUT THE REST OF US BEWARE!! Do your math!! If the 10% maximum allowance is exceeded, you could find yourself in a world of hurt! We are talking misclassification claims! Also, ensure you know the proper distinctions between discretionary and non-discretionary bonuses! Employers will change benefits or other operation costs to compensate for the increased burden. Well, that’s just lower than a snake’s belly in a wagon rut! PCS Medicaid Reimbursement Rates Are TOO LOW to Maintain Adequate Quality of Care, in Violation of the Code of Federal Regulations! I recently spoke at the Association for Hospice and Home Care (AHHC) and the NC Association for Long Term Care Facilities (NCLTCF) conferences. At issue at both conferences was the reimbursement rate for personal care services (PCS), which is extremely important to both home health agencies (HHAs) and long-term care facilities (LTCFs). Both AHHC and NCLTCF, as associations, are vital to the HHAs and LTCFs across the state. Associations provide a network of peers, up-to-date information, and lobbying efforts. The old saying, “United we stand, divided we fall,” comes to mind. I think “The Four Oxen and the Lion” is indicative as to the importance of an association, generally. An association is truly essential when it comes to lobbying. There are two times during which we have a potential impact as to the wording of statutes: (1) During the forefront, by lobbying efforts; and (2) At the backend, through litigation. Obviously, if the forefront is successful, then there becomes no need for the backend. Much to my chagrin, in my explanation above, I am the “backend.” Hmmmm. Because I am a litigator and not a lobbyist, I am only called upon if the forefront fails. In the last session, the General Assembly enacted Session Law 2014-100, which reduced the Medicaid reimbursement rates for all services by 3%. The PCS reimbursement rate became $13.88. Session Law 2014-100 was signed into law August 7, 2014; however, Session Law 2014-100 purports to be effective retroactively as of October 2013. (This brings into question these possible recoupments for services already rendered, which, in my opinion, would violate federal and state law, but such possible violations (or probable or currently occurring violations are a topic for another blog). It is without question that the Medicaid reimbursement rate for PCS is too low. In NC, the PCS reimbursement rate is currently set at $13.88/hour (or $3.47/15 minutes). It is also without question that there is a direct correlation between reimbursement rates and quality of care. Because Medicaid pays for approximately 67% of all nursing home residents and recipients of home health care in USA, the Medicaid reimbursement rates and methods are central to understanding the quality of care received by PCS services and the level of staffing criteria expected. PCS for adults are not a required Medicaid service. As in, a state may opt to provide PCS services or not. As of 2012, 31 states/provinces provided PCS services for adults and 25 did not. Most notably, Florida, Virginia, and South Carolina did not provide PCS services for adults. See Kaiser Family Foundation website. Why should we care about the Medicaid PCS reimbursement rates? 1. Low reimbursement rates directly, and negatively, impact quality of care. 2. 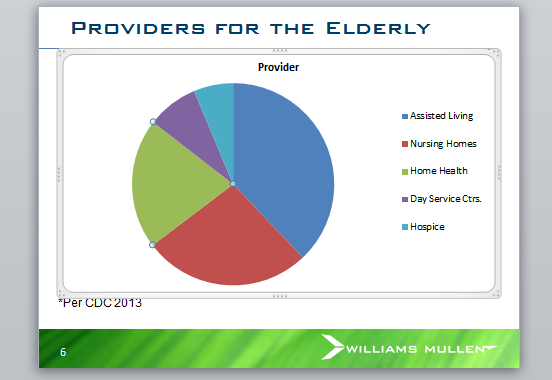 The aides who provide the PCS services, whether in someone’s home or at a LTCF, are often, him or herself on Medicaid. 3. It is in our best interest as a public for home health care agencies and LTCF to continue to accept Medicaid recipients. 4. It is in our best interest as a public for home health agencies and LTCF to stay in business. #1: Low reimbursement rates directly, and negatively, impact quality of care. In an article entitled “Nurse Staffing Levels and Medicaid Reimbursement Rates in Nursing Facilities,” written by Charlene Harrington, James H Swan, and Helen Carrillo, the authors found that the Medicaid nursing home reimbursement rates were linked to quality of care, as to both RN hours and total nursing hours. Numerous other articles have been published in the last few years that cite the direct correlation between reimbursement rates and quality of care. The argument can be made that $13.88 is too low a reimbursement rate to ensure adequate quality of care. However, again, because this rate was not prevented at the forefront, it would entail a “backend” act of litigation to adjust the current reimbursement rate. (It is important to note that beginning next year, there will be an additional reduction of rate by another 1%). #2: The aides who provide the PCS services, whether in someone’s home or at a LTCF, is often, him or herself on Medicaid. According to the Paraprofessional Healthcare Institute, an advocacy group for home care workers, 1 in 4 home health workers has a household income below the federal poverty line and more than 1 in 3 do not have health insurance. Think about this…home care workers provide PCS to the elderly, disabled, and needy, many of which are on Medicaid and Medicare. Home care workers work full-time changing diapers, assisting with ambulation, dressing, and grooming for the elderly, yet 1 in 4 home care workers are eligible for Medicaid themselves. Currently, federal minimum wage is $7.25/hour. 18 states have minimum wage equal to the federal minimum wage, including North Carolina. 23 states set minimum wage higher than the federal level. Washington D.C. pays the highest minimum wage at $9.50/hour. PCS reimbursement rates in NC are $3.47/15 minutes, or $13.88/hour. $13.88 is above the federal and NC minimum wage of $7.25. However, just because the PCS reimbursement rate is $13.88/hour does not mean that the PCS workers are receiving $13.88/hour. The owners of HHAs and LTCFs pay their workers much less than $13.88/hour; they have overhead, insurance, taxes, salaries, etc. 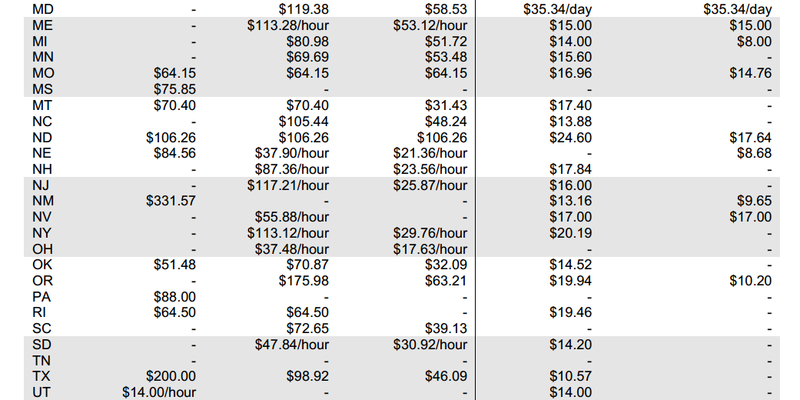 to pay…not to mention a percentage of the $13.88/hour needs to be allocated to profit (albeit, however, small). According to the Bureau of Labor Statistics, in 2013, the average PCS worker’s salary in NC is $19,392/year, or $1,660/month. Working 40 hours a week, a salary of $17,280 equates to approximately $10.10/hour. Obviously, $10.10 is well-above our $7.25 minimum wage, although difficult to make ends meet. The average fast food worker’s hourly wage is $7.73. In order for an increase of hourly pay, of any amount, for home health workers, the Medicaid PCS reimbursement rate would need to be increased. With the current PCS rate at $13.88/hour, home health workers are getting paid between $8.00-11.00/hour. In order for PCS workers to receive $15.00/hour, the PCS rate would need to be increased by $2.00-5.00/hour. #3: It is in our best interest as a public for HHAs and LTCFs to continue to accept Medicaid recipients. What if HHA and LTCF refused to accept Medicaid recipients because the reimbursement rates are simply too low? With the number of people dependent on Medicaid, if HHAs and LTCFs refused Medicaid recipients, our elderly and disabled would suffer. Perhaps the average length of life would decrease. Perhaps we would implement legal euthanasia. Perhaps the suicide rate would increase. Perhaps the homelessness percentage would reach an all-time high. Is this the world in which you want to live?? Is this the world in which you want to age?? In my opinion, the way we treat our elderly, disabled and needy population is a direct reflection on the level of civilization or educated sophistication. Not only do Koreans respect the elderly, but they also celebrate them. For Koreans, the 60th and 70th birthdays are prominent life events, which are commemorated with large-scale family parties and feasts. As in Chinese culture, the universal expectation in Korea is that roles reverse once parents age, and that it is an adult child’s duty — and an honorable one at that — to care for his or her parents. #4: It is in our best interest as a public for HHAs and LTCFs to stay in business. Or we can become more like the Koreans. At least, in this one respect, would emulating the Korean attitude be so bad? Obviously, we cannot shift the American attitude toward the elderly, disabled and needy within one generation. But we CAN increase the PCS reimbursement rate.